January 20th, 2016, started off as a day like any other. As was usually the case, he arrived at the office a little early. Getting his morning coffee, he sat down at his desk to find a surprise. It was a LinkedIn message from Roger Guyett, the VFX Supervisor and Second Unit Director at ILM for the new Star Wars: The Force Awakens movie. He agreed to do an interview for the podcast that following week. Delighted, he shot off a quick “thank you” before grabbing his notebook for his 10 o’clock meeting. A few minutes later, he returned to his desk. He sent another message to Roger, this time apologizing that he wouldn’t be able to do the interview after all—the podcast was just one of the casualties in the massive downsizing he’d just been a part of. I still remember the roller coaster of emotions in that moment. My immediate focus was figuring out how I’d put food on the table for my family. After getting back on my feet, I was determined to do another podcast. But I wasn’t so sure I could wrangle the schedules of artists working on the hottest movies and games like my last one. Nor was I sure I could continue one as regularly with my co-host and good friend who also worked on that podcast. So I needed to find a way to do a podcast that I could do with my new schedule…the new normal. That’s why, a couple months later, the very first episode of Based on a True Story was released—on April 2nd, 2016, to be precise. At the time when I released the first episode, I wasn’t really thinking about what I’d be doing with it a year later, but when the first anniversary rolled around last year, I wanted to do something a little different. Then I realized there’s another annual tradition right around this podcast’s anniversary. I’m speaking, of course, about today—April 1st—or April Fool’s Day. So that’s why, last year, I decided to play a little April Fool’s prank by surprise-releasing an episode that was clearly not a movie that’s based on a true story. Instantly, I knew what I’d cover. Like countless other Tolkien fans, The Lord of the Rings trilogy are my favorite books. Even though the movies could’ve been better, they gave us the chance to see the pages come to life in a new way—so the movies hold a special place for me, too. Originally, I planned on doing a single episode to cover all three movies. But then, just like what happened when they planned to make a single movie out of all three books, that turned out to be too much for a single episode. Remember, the April Fool’s Day episode was on top of creating the regular weekly content—haha! So that’s why, one year ago today, a special episode comparing the differences between The Fellowship of the Ring book and movie was released. After it released, I received a lot of great feedback about that episode. A lot of them were requests to finish the trilogy. But simply put, I couldn’t guarantee the podcast would be around another year—since this is a passion project for me and not something funded by a massive corporation like a lot of the bigger podcasts out there. Fast forward to today, while I still can’t predict the future to know if this show will be around next year, let’s take this one year at a time. Before we worry about covering the third movie next year, we need to cover the second movie—The Two Towers. Then, after crumbling the bridge, the Balrog catches Gandalf’s foot, tripping him up. Then, after whispering, “Fly, you fools!” to the rest of the Fellowship, Gandalf falls. In the first film, we followed the adventures of the Fellowship as they deal with what they assume was the death of Gandalf. But in The Two Towers, our story begins by following Gandalf’s side of that tale. He’s falling…falling…as he falls, Gandalf fights with the Balrog. Cutting to a dark cave, we see a very small light at the top of the screen. That tiny speck is Gandalf and the Balrog—who is huge—so that just gives you an idea how massive this cave is. The sequence ends just as Gandalf and the Balrog hit the water. All of a sudden, we’re shot to Frodo—who awakens with a start, almost like he was dreaming the whole thing. That whole scene was not in the book. Well, not in The Two Towers. Well, not really. So the movie is flashing back to something we saw in The Fellowship of the Ring, of course. And while it’s true that the whole scene on the Bridge of Khazad-dûm was in The Fellowship of the Ring book, The Two Towers didn’t start by giving us a peek at what it was like from Gandalf’s perspective. The way the book begins is actually with something we already saw, too. If you listened to The Fellowship of the Ring episode of Based on a True Story where we focused on comparing the first book with the first movie, you’ll know that the very last scene in the first movie is actually the first scene in the second book. Remember when we saw Boromir’s death at the end of the first movie? That’s how The Two Towers book starts. So for the sake of our story today, we’ll actually have to hop a little further back to The Fellowship of the Ring. In that sequence, Sean Bean’s version of Boromir stumbles upon Frodo and Sam. When he realizes that the two hobbits plan to leave the Fellowship and make their way to Mordor on their own, Boromir is tempted to take the ring from Frodo. He wants to do it for a good reason—to fight back the evil that threatens the race of men. But surely the power of the ring would start to turn Boromir, so he resists the urge. Instead, we see Boromir sacrifice himself for the good of the Fellowship. More specifically, he fights off the Uruk-hai so that Sam and Frodo can escape. One of the final scenes in that movie is one of the saddest—when Boromir is struck down with a number of arrows. Then we see the Uruk-hai captain, Lurtz, tower over the helpless Boromir. Rushing to the scene just a moment too late, Viggo Mortensen’s version of Aragorn kills Lurtz. But it’s too late for Boromir, who dies in Aragorn’s arms. Well, Lurtz wasn’t a real Uruk-hai captain. He’s not in any of the books. But the gist of Boromir’s self-sacrifice is pretty accurate. So is the conflict that Boromir went through. Talking to Frodo, Boromir suggested they stop by Minas Tirith on the way. It’s on the way to Mordor, anyway, he reasoned, and the men there can use the Ring to fight off Sauron. When Frodo refused, Boromir chased after him in a rage until…like we see in the movie, Boromir realizes what he’s doing. It was here that Frodo realized that the Ring was having an effect on the Fellowship. He couldn’t stay. So he determined to take the Ring on his own. Of course, we know Sam ended up going with him. In the book he did this by following Frodo and swimming out to his boat, almost drowning in the process. That’s how The Fellowship of the Rings book ends. Then with the rest of the Fellowship trying to find Frodo, Aragorn hears Boromir’s horn blow. That’s how The Two Towers, the book, begins. The book follows Aragorn here, so we don’t really see Boromir’s side of the story. But when Aragorn sees Boromir, he finds him surrounded by scores of dead orcs. Unfortunately, just like we see at the end of the first movie, Boromir was riddled with black arrows. And just like we see in that sad scene, Aragorn arrives just in time to hear Boromir’s final words—a call for Aragorn to save his people in Minas Tirith. Aragorn asks where Frodo went and Boromir merely smiles, closing his eyes for good. Oh, and one big difference between the death of Boromir that was the touching ceremony that Aragorn, Legolas and Gimli had. They sang songs and sent his body over the falls in a boat—sort of like the honorary Nordic funerals where they’d send the body out on a boat and shoot burning arrows at it. We didn’t see any of that in the movie. Now that we’ve got a good idea of how the movies changed how the ending of The Fellowship of the Ring and the beginning of The Two Towers changes things from the books, let’s hop back to The Two Towers movie. Remember that moment when Frodo startles awake the moment that Gandalf and the Balrog hit the water? Well, after this, we see Frodo and Sam begin their march to Mordor. As they’re traveling, this is where they run into Gollum who is trying to get the Ring back. But the hobbits overpower him and tie a rope around his neck, almost dragging him behind them for a while. That all happened, but there’s a very important distinction to make. It didn’t happen here. By that, what I mean is that it didn’t happen here in the timeline of the story. Was Frodo dreaming about Gandalf falling? That seems to be what the movie implies, but the book doesn’t at all. In fact, The Two Towers book is broken up into two separate books. So this part where Frodo and Sam capture Gollum is actually in Chapter One of Book Two of The Two Towers. Although, some super fans of The Lord of the Rings might argue that it’s actually Book Four. The reason for that is because some people prefer to number them in reference to The Lord of the Rings as a whole volume. The Fellowship of the Ring was the first two books, The Two Towers was the second two and without getting too ahead of our story, The Return of the King was the final two. Six total books making up three, well, books that make up the whole volume of The Lord of the Rings. My point in mentioning this is because the book keeps these two storylines separate. Book One in The Two Towers is all about Aragorn, Legolas, Gimli, Merry and Pippin. Book Two is all about of those is about Frodo and Sam. So keep that in mind throughout this episode because I’m going to follow the movie’s timeline. Since the purpose of this podcast is to compare movies to history and not the other way around, that means in this case because the movie ties the storylines from Book One and Book Two together, I’m going to do that as well. Oh, it’s worth pointing out that Frodo and Sam didn’t really tie a rope around Gollum’s neck. It was his ankle. That might seem like semantics, but the movie makes it seem like Frodo and Sam were rather sadistic when, in fact, they weren’t. Going back to the movie, during the battle with the Uruk-hai that saw Boromir die, the two hobbits, Merry and Pippin, get captured. In the movie, Aragorn knows that Frodo has left the party and insists they still have work to do—rescue Merry and Pippin. That’s pretty close, but there’s a little difference there. In the book, Aragorn isn’t so sure about Frodo and Sam’s whereabouts. All he knows is that the hobbits are missing. All of them. In their brief conversation before, Boromir told Aragorn that the hobbits had been captured. But he didn’t specifically mention how many of them there were. Since Aragorn had sent Boromir to look for Merry and Pippin, they assumed it was them. And without knowing for certain where Frodo and Sam might be, but knowing that Merry and Pippin were in immediate trouble, that’s why the rest of the Fellowship decided to go find Dominic Monaghan’s character, Merry and Billy Boyd’s character, Pippin. One of the reasons they don’t know for sure is because of another difference between the book and the movie. In the movie, Legolas actually sees Frodo and Sam climbing the opposite bank of the river. In the book, though, he didn’t. Instead, Aragorn found their footprints so he assumed that they must’ve crossed the river—but they weren’t seen doing so. Back in the movie, the hunt is on. We see shots of the Uruk-hai with their two prisoners, Merry and Pippin. Then there’s shots of the Fellowship tracking them. The seven in the Fellowship that left Rivendell in the first movie has dwindled—now it’s made up of Aragorn, Orlando Bloom’s version of Legolas and John Rhys-Davies’ version of Gimli. Cutting back to the Uruk-hai holding Merry and Pippin, they get ambushed by Karl Urban’s character, Éomer, and a band of the famous Rohirrim horsemen. During the chaos of battle, Merry and Pippin manage to sneak off unnoticed into Fangorn Forest. The basic gist of that is fairly accurate, but there’s more to the story. Oh, and as a little side note, I didn’t really mention this because it’s not in the theatrical release, but in the extended edition of the movie we see Théodred die. Théodred was Théoden’s son and the heir to the throne of Rohan—Éomer’s cousin. That’s in the book, although technically, Théodred was taken back to Edoras for burial in the movie but he was buried where he died in the book. So in the book, we actually see things from the perspective of Aragorn, Legolas and Gimli first. For that reason, in the book, we don’t really what’s happened to Merry and Pippin quite yet. As the three continued tracking the Uruk-hai, Aragorn was explaining the horsemen who lived in the lands they were traveling. The Rohirrim. Proud and noble men who have true hearts but, as Aragorn said, they thought Saruman was an ally as well. Who knows what has changed in these times. That’s when, in the movie, we see the Rohirrim approach the Fellowship. Well, sort of. Very minor detail, but the book never mentions Aragorn as being the first to hear the thundering hooves first in the book—it only mentioned that Gimli heard it last. And while we’re speaking about minor details, in the movie’s version, the three hide behind some nearby rocks. Then, after the Rohirrim pass by, Aragorn steps out and catches their attention by calling to them. But the Rohirrim were just as oblivious. Perhaps even moreso. You see, what really happened was that Aragorn, Legolas and Gimli were sitting still in the field. The riders didn’t even seem to notice them, passing right by until it was, as the movie shows, Aragorn who called out to them. Then the next scene we see is fairly accurate as the Rohirrim circle around the three travelers. It’s here, just like we saw in the movie, that Éomer tells Aragorn, Legolas and Gimli about their ambush of the orcs. Although, the movie’s version of events is quite a bit more laid back. In truth Aragorn introduced himself as Strider, since he didn’t know who Éomer was. On the other side, Éomer had no idea how they managed to stay hidden from the Rohirrim and thought perhaps they were all elves. Before giving his real name, Aragorn challenged Éomer—asking who he serves. Are you friend or foe of Sauron? He asked point blank. 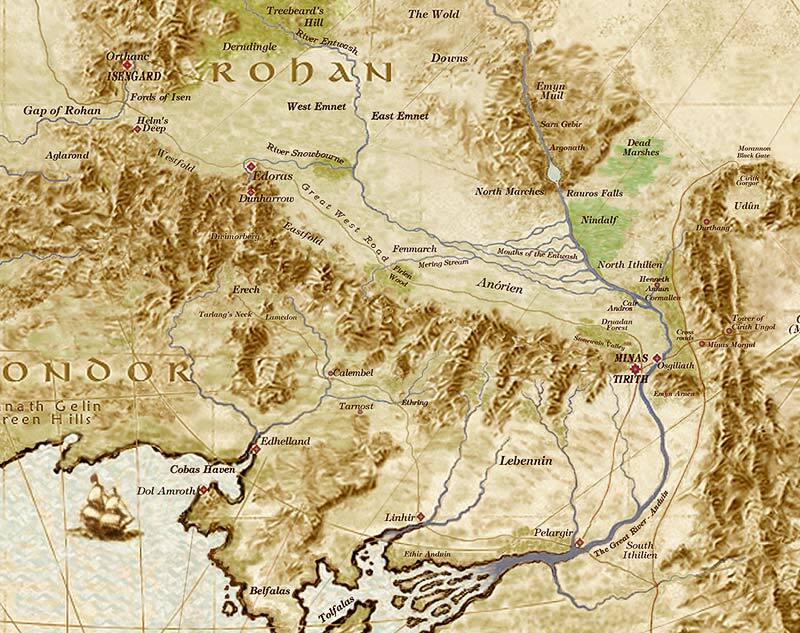 At that time in history, the men of Rohan weren’t at war with Mordor. Nor were they friends of Mordor. And Éomer said as much. Only after this much more dramatic scene did Éomer tell Aragorn about the orcs. But just like the movie shows, Éomer didn’t know about the hobbits. He only knew about the orcs he slew—no hobbits were among them as far as he knew. It was only after this, in the book, that we see things from Merry and Pippin’s side. And on that side, things happen pretty close to what we see in the movie. There’s some small differences, like technically Pippin wasn’t riding on the back of an orc when he lost the brooch that Aragorn found later. He was on his own, but with orcs chasing him, he dropped the brooch in hopes that someone would find it. There wasn’t much hope, though. Pippin was sure that the rest of the Fellowship had went after Frodo. Thankfully, he was wrong. The brooch helped Aragorn, Legolas and Gimli know that they were on the right path. It is true, though, that Pippin and Merry managed to escape the chaos of the skirmish and make their way into Fangorn Forest. Speaking of which, one of the biggest changes in this scene that we saw in the movie was probably when the orcs cut down trees from Fangorn to start fires. In truth it wasn’t the orcs who did this. It was the Rohirrim, who used the wood from Fangorn Forest to burn the bodies of the orcs they slaughtered. Going back to the movie, it’s inside Fangorn Forest where Merry and Pippin run into a new character. As they’re escaping from the orcs, the two hobbits climb a tree. Then a hand reaches up and rips Merry from the tree. It’s Grishnakh, one of the orcs. Just as he’s about to kill Merry, the tree Pippin is in comes alive. Then it squishes the orc and swoops up Merry, holding both hobbits in his hands and ponders if they’re just little orcs. Merry and Pippin are fascinated by Treebeard. He’s voiced by John Rhys-Davies—the same actor who plays Gimli. They think he’s basically a huge, living tree. This he scoffs at. Tree? I am no tree! I’m an Ent! The overall storyline is close, but there’s some differences here. If you remember, Aragorn didn’t know who Éomer was at first, so there’s no way Merry and Pippin would’ve known the riders who were killing the orcs wouldn’t finish them off when they were done. Terrified, they escaped to the forest while the orcs and Rohirrim were battling. None of the orcs actually made it into the forest after them. They were preoccupied with Éomer and his men, who eventually killed them all. Once in the forest, the two hobbits kept going. And going. They went as fast as their little legs could carry them until, finally, their fear of orcs chasing them slowed. Then they started to realize something—they had no idea where they were. As they were admiring the forest around them, that’s when they heard a voice. Treebeard. And for the most part, the movie does a pretty good job of bringing him to life. He’s not a tree. The movie is right, there. But Ents look like trees, so I can see Merry and Pippin’s confusion. Especially since, if you remember from the first movie, hobbits aren’t prone to adventures outside of the Shire. Going back to the movie, Treebeard doesn’t know what to do with these little orcs that keep insisting they’re hobbits or halflings. So he decides to take them to someone who will know what to do. The white wizard. Merry ties that to name right away: Saruman. If you remember from the first movie, the head of the wizarding order had proven to be in league with Sauron. Treebeard drops them off in front of the white wizard, but the camera angle is from over the wizard’s shoulder so we can’t see who it is exactly. Perhaps it was because when Treebeard first met the hobbits, they were complimenting the forest. Or maybe it’s that the hobbits posed no threat to Treebeard. Upon meeting, the hobbits and the Ent seemed be much friendlier and with more trust than what we see in the movie. Their conversation continued with Treebeard and the two hobbits explaining what hobbits are. So the movie got it right that Treebeard hadn’t heard of hobbits. Speaking of something the movie got right, there’s a brief moment in the movie where Pippin asks Treebeard who’s side he’s on. Treebeard replies that he’s not on anyone’s side because no one is on his side. Well, that conversation was changed for the film, but the basic gist is true. And it’s important because that question was really a two-part question. Oh, and it was Merry who asked it, not Pippin. So Merry asked Treebeard who’s side he was on, but also if he knew Gandalf. We don’t really know why Merry asked this, but if we put ourselves in his shoes it makes sense. Hobbits don’t venture outside the Shire much, but they know Gandalf does. So if there’s anyone Treebeard might know, it’d probably be Gandalf. And he did. Treebeard replied that Gandalf was the only wizard who really cares about trees. Treebeard noticed the past tense. Was? Why do you say it like that? Then Pippin let Treebeard know that Gandalf was gone, which confused Treebeard who apparently hadn’t heard the news. The two hobbits asked Treebeard if he could give them something to eat and drink since they’d lost their packs. He happily obliged. The conversations continued as Treebeard carried the hobbits 70,000 ent-strides through the forest to his ent-house where he offered them ent-draught to drink. Sorry, I can’t really convert ent-strides to miles or kilometers. There, they rested and Treebeard eagerly listened to the story of their journey so far. The hobbits, no doubt super excited to get a chance to tell their tale while feeling safe for once, took the time to recount their story to date. None of that is in the movie, although there is a brief moment in the extended edition of the film where we see the hobbits discover ent-draught. It’s probably worth pointing out that in the book, it’s during these conversations, that Treebeard was super interested in the activities of Gandalf and Saruman. And while the hobbits knew some about Saruman from second-hand reports given through Gandalf at the Council of Elrond, they didn’t know much. In fact, at one point in the conversation, Pippin asked Treebeard outright: Who is Saruman? So that’s a little different than what we see in the movie where Pippin quickly jumps to Saruman being the white wizard. And that’s not the only thing about this scene that’s quite a bit different in the movie. But we’ll come back to that. Hopping back to the movie’s timeline, the next major plot point takes us back to Frodo and Sam. They’re traveling in the Dead Marshes led by Gollum, who they’ve let free from the rope and has become their guide in lands unfamiliar to Frodo and Sam—but well-traveled by him. Well, it wasn’t daytime like the movie shows, but Gollum did lead Frodo and Sam through the Dead Marshes. Gollum didn’t want to travel by day because, as he explained it, the Yellow Face shows you up. Translated, you’re easier to see during the day. Oh, and it was Sam who fell into the marsh to see the dead faces, not Frodo. After this, back in the movie, we’re hopping back to Aragorn, Legolas and Gimli. They followed Merry and Pippin’s tracks from the Rohirrim’s battle with the orcs into Fangorn Forest. Almost immediately upon entering it, Legolas senses something. Calling to Aragorn, he says the white wizard approaches. Like Merry and Pippin did before in the movie, they think it’s Saruman, too. But we see it’s not. It’s Gandalf. And here’s where Gandalf tells the tale of how he fought the Balrog. When he finally defeated his foe, he nearly died—but awoke not as Gandalf the Grey, but as Gandalf the White. It was here, on the edge of Fangorn Forest, when Aragorn, Legolas and Gimli met back up with Gandalf. Shocked and happy to find their friend alive, Gandalf recounted the tale of how he fell from Durin’s Bridge into a place beyond light and knowledge. But Gandalf didn’t kill the Balrog here. He utterly defeated him, extinguishing his flame and turning him into a slimy creature that Gandalf likened to a snake. But in the end, the Balrog fled in tunnels so far down in the earth that they have no name. So old, so deep and dark that there is no knowledge of when or how they were created. Then Gandalf climbed the Endless Stair from the depths to Durin’s Tower near Celebdil. If you’re not familiar with Middle-earth’s geography, that’s one of three mountains above the Dwarvish city of Khazad-dûm. Here, the Balrog erupted again—his flame renewed. The battle continued until, again, Gandalf emerged victorious, casting the Balrog from the mountain. After this, Gandalf seemed to have passed out. Very similar to what we see in the movie. There was a bright light. Then nothing. When he awoke, he was naked and lying atop the mountain. His task here on earth was not done. Gandalf the Grey was now Gandalf the White. If this were a video game, he leveled up. Back in the movie, after Gandalf rejoins the party, he says they must head to Edoras in Rohan. Then we get to see his horse for the first time, Shadowfax. Pretty horse. Interestingly, in the movie here, if you pause it and look behind Ian McKellen’s version of Gandalf as he whistles for Shadowfax, you’ll notice that Legolas and Aragorn already have horses. The movie doesn’t really explain this here, but earlier when Aragorn met Éomer, they get horses to head back to the site of the battle between his Rohirrim and the orcs. Then when Aragorn, Legolas and Gimli venture into Fangorn Forest, they don’t have horses. So the movie seems to imply they left their horses here. But that’s not true. Well, not really. They did leave their horses outside Fangorn. But when they re-emerged with Gandalf, their horses were gone. They must’ve run off. After Gandalf gives his long whistle, which we also see in the movie, that’s when Shadowfax appears. But he wasn’t the only one. Along with Shadowfax, who was described as the lord of horses, came the other two horses they had before. Or at least, that’s what I’m assuming because Legolas knew the horses by name when they arrived. Oh, and Shadowfax ran all the way from Rivendell to find Gandalf. So it’s not like he came just at the time of the whistle. But that’s a minor detail. What is true about that scene is that Gandalf told them they must head to Edoras with great haste—hence the need for the horses instead of walking. As a little side note, Gandalf also relayed a message from Galadriel to Aragorn, Legolas and Gimli, but that’s not in the movie at all. Galadriel was the character played by Cate Blanchett. Back in the movie, after this Gollum leads the two hobbits to the Black Gates—Mordor’s front door. Here there’s a close call where the two hobbits are nearly seen after Sam slides down the hill. But they hide under their cloak, which camouflages them in with the rocks. It’s only after this when Frodo is about to make a dash for the door that Gollum tells them he knows of a different way into Mordor—a back door. That’s sort of what happened, but there were some changes made for the movie here. After emerging from the Dead Marshes, Frodo and Sam were exhausted. It was five days since Gollum had been guiding them, and the path was hardly an easy one. Even though the movie doesn’t show it, they decided to rest by a pit. That’s what they slid down—not the rocky mountainside type landscape we see in the movie. And it was Frodo who slid down the pit first, probably while he was sleeping. They spent most of the day resting, only continuing their journey to the Black Gate when evening began. Oh, and even though it’s not in the movie, there’s a moment here when Sam woke up from the nap he never really intended to take and heard Gollum talking to someone. It was himself—Sméagol. We saw this debate in the movie, but not until later on. They seemed to move it. Sam overheard the debate as he pretended to sleep. He must not get the Precious. We must have it! But we hate the Bagginses—they stole it from us. Not this Baggins, Master is kind. But there’s two of them, they’ll kill us. Oh, but she might help. Oh no! We mustn’t go that way! Meanwhile, Sam wondered…who is she? So it’d seem that Gollum had a bit of an ulterior motive with mentioning another route into Mordor. Although it is true that Gollum led them to the Black Gate and then talked Frodo out of going in. It was Sam who asked the obvious question: Why did you bring us here, then? There wasn’t a physical restraint like we saw in the movie when Gollum thrusts himself on Elijah Wood’s version of Frodo as he tries to dash into the gate. In truth, Frodo asked Gollum to lead them to the Black Gate—so he did. We don’t really know if Gollum made the assumption that Frodo wanted to go inside, or if he was simply doing as he was asked. For his part, though, Frodo didn’t know there was another way to get inside. Going back to the movie, next we see Gandalf, Aragorn, Legolas and Gimli riding into Edoras. The movie doesn’t really say this outright, but Edoras is the capital of Rohan. That’s where, in the movie, the four companions meet with Bernard Hill’s version of King Théoden. When they arrive, they’re stripped of their weapons but Gandalf manages to keep his staff—or walking stick, as he calls it. That happened, but there’s a big difference here that’s worth pointing out. The movie doesn’t mention this at all, but as they surrendered their weapons they mentioned the lineage. This is important because Aragorn’s sword was none other than Narsil, which he commanded the soldiers at Rohan to not touch. Remember in The Fellowship of the Ring movie when we see Sean Bean’s version of Boromir cut his finger on the shards of Narsil while they’re in Rivendell for the Council of Elrond? That’s the same sword. The sword that cut the Ring of Power from Sauron’s hand by Isildur, the son of Elendil. Well, in the movies it’s not reforged until the third one—The Return of the King—but that really happened much earlier, in The Fellowship of the Ring book. Back in The Two Towers movie, though, after entering the Golden Hall, it’s clear Théoden isn’t well. He’s old, decrepit looking and seems to be under the control of a spell. Meanwhile, Brad Dourif’s character, Grima Wormtongue acts as a sort of advisor to the king. But he’s one of those guys you can tell he’s a bad guy just by looking at him. With the king under a spell, for all intents and purposes it’s Wormtongue who is running Rohan. That’s not really what happened. I mean, it is. But not really. Let me explain. As the four companions entered the Golden Hall, they saw an old man sitting on a great chair at the other end. He had white hair and beard—similar to what we see in the movie. But his eyes were fierce, not glazed over like we see in the film. And while Bernard Hill’s version of King Théoden has a hard time speaking, the real Théoden had no troubles speaking forcefully—even arguing with Gandalf at one point. But Wormtongue was real, and did act as the advisor of sorts to Théoden. So that part is similar to what we see in the movie. And while there were too many subtle differences to name here in how it happens, the overall gist of what happens next is pretty close to what we see in the movie. By that, what I mean is that Gandalf throws off his cloak and raised his staff. Wormtongue is surprised—he told them to take the staff! The hall was cast into complete and utter darkness. The only thing visible was Gandalf the White. After Gandalf cast the hall into darkness, there was thunder and a flash of lighting…then dead silence. Probably one of the biggest changes in the film here is that there’s no mention of a magical transformation for King Théoden. Wormtongue was the advisor to the king and was paid off by Saruman to deceive Théoden. The movie’s rendition of this part of the story seemed to play it up quite a bit more than there was. Speaking of which, going back to the movie, after this, Gandalf leaves Edoras in search of Éomer and his Rohirrim. He promises to return in five days. Meanwhile, King Théoden decides to have the people of Edoras march to their stronghold—Helm’s Deep. Built into the mountain, King Théoden believes this is the best chance of survival against an attack from Saruman. And the attack is coming, because we see Wormtongue high tail his way out of Rohan to Saruman, telling him what happened. That’s when we see tens of thousands of orcs in his army. Their march to Rohan begins. That’s not really how it happened. While Gandalf was talking with Théoden about what to do with Grima Wormtongue, Gandalf suggested that Théoden call for Éomer. So Háma was sent to be a messenger, a form of punishment from Théoden for not doing a good job as a doorward. Háma, by the way, is the guard who we see taking the weapons from the four companions before they enter the Golden Hall. He’s played by John Leigh in the movie. In fact, Éomer was the one who handed Théoden his sword after Gandalf had his line suggesting that the king’s fingers would remember their strength better if they grasped his sword. It was around this time of the remark that Théoden gave Gandalf a smile, and many of the lines on his face were smoothed away. Then, as Théoden turned to face Éomer, he stood—no longer an old man leaning on a walking stick. So I know the magical transformation didn’t happen for the king, but I suppose if it did that would’ve been it. But even then, as we just learned it didn’t happen all at once. So if Gandalf didn’t go off to find Éomer here while the rest of the group went to Helms Deep, what happened? Well, they did split up, just not like we see in the movie. Gandalf, Aragorn, Legolas and Gimli rode with Éomer and Théoden along with the forces of Rohan with the intention of defeating Saruman at Isengard. Left to lead the people of Rohan was Éowyn. She’s played by Miranda Otto in the movie, and was Éomer’s sister—the children of Théoden’s sister. This is a pretty big change because, as you can probably imagine, this means Éowyn wasn’t at Helm’s Deep with all of the women and children of Rohan. In fact, Éowyn’s job was to lead the remaining people in Edoras to the Hold at Dunharrow. For some geographical context here, Dunharrow is only about 20 miles, or about 32 kilometers, south of Edoras. On the other hand, Helm’s Deep is maybe about a hundred miles, or about 160 kilometers, to the west of Edoras. So you have mountains on either side and then there’s a gap between them. That’s the Gap of Rohan. On the north side of that are the Fords of Isen and Saruman’s stronghold nestled near the foot of the Misty Mountains, Isengard. Then on the south side of the Gap of Rohan you have the fortress of Helm’s Deep. Because of its close proximity to Isengard, that’s where Gandalf, King Théoden and the rest of the Rohirrim were headed. Going back to the movie, after this is when we see the scene where Sean Astin’s version of Samwise Gamgee overhears Gollum and Sméagol talking to himself. But we already talked about how that was actually before Frodo and Sam were at the Black Gate, so let’s jump ahead to the next major plot point. Po-ta-toes. Boil ’em, mash ’em, stick ’em in a stew. Well, Sam did say the “Po-ta-toes” line, he never really said the “Boil ’em, mash ’em, stick ’em in a stew” line. Although the basic setup is pretty accurate around when it happened, if we overlook the fact that Sam had to ask Gollum to go find some food—he didn’t do it on his own. That would be as Sam was making stew from some rabbits that Gollum had found in the wilderness for the trio, much to Gollum’s dismay at cooking them. After this, back in the movie, after witnessing a raid on Southron fighters where Sam sees an oliphaunt get attacked, Frodo, Sam and Gollum are captured by a band of men led by David Wenham’s version of Captain Faramir. As they talk, we find out that Faramir was Boromir’s brother. After finding out that Frodo has the Ring of Power, Faramir thinks it can help save Gondor and decides to take them back to the White City—Minas Tirith. It is true that Frodo, Sam and Gollum were captured by Faramir’s rangers, but that happened before the attack on the Haradrim soldiers and their oliphaunt—the Haradrim, or Southrons as they’re also called since they’re from southern Middle-earth, were enemies of Gondor. As for Faramir—well, his character is one that had a lot of people upset with how we see him in the film. You see, the real Faramir didn’t have his men beat and torture Gollum. That goes against the nature of the men of Gondor, especially for a noble man like Faramir. And then there’s Faramir and the Ring. One of the big differences in the movie here had to do with how the Ring possesses those that possess it. By that, what I mean is that in the movie we see the Ring have an almost instantaneous effect on those who even touch it. That’s not really the case. In truth, the Ring’s power was much more subtle. It took effect over a longer period of time, which is why everyone was so surprised at how Frodo and Bilbo were able to resist its power for so long. Despite this, though, Faramir never wanted to see the Ring after capturing Frodo, Sam and Gollum. While he did suggest taking them to Gondor, unlike what we see in the movie, he didn’t. Faramir let Frodo, Sam and Gollum go on their way. Speaking of which, back in the movie, Aragorn arrives at Helm’s Deep much to the surprise, and glee, of those there. If you recall, he fell during the warg attack on the column headed to Helm’s Deep and everyone thought he was dead. That’s when we saw the dream sequence with Arwen. I didn’t mention that earlier because, well, that didn’t happen. Neither did the warg attack where we saw Aragorn fall off the cliff in the movie. It’d seem all of this was added to throw Aragorn’s love interest in the movie, when, in fact, Arwen isn’t in The Two Towers book at all. The filmmakers had the rest of the company arrive well beforehand so they could delay Aragorn’s arrival so he could, in turn, have that dream sequence with Arwen. There’s a brief scene in the movie where we see Viggo Mortensen’s version of Aragorn come across the forces of Isengard marching. That’s just before he arrives at Helm’s Deep. So if that didn’t happen, when did Aragorn arrive at Helm’s Deep? Well, he arrived with King Théoden, Legolas, Gimli and the rest of the Rohirrim that left Edoras together. As the Rohirrim neared the Gap of Rohan, a lone horseman was seen in the distance. When he reached them, he gave them grave news that the hosts of Isengard have emptied. He said some of the men that were with him have fled to nearby Helm’s Deep while the others are scattered. That’s when Gandalf suggested they ride for Helm’s Deep with haste! At this time, Gandalf split off saying he had to rush to an errand and would return to meet them at Helm’s Gate. Back in the movie, we’re whisked across Middle-earth to Fangorn Forest where Merry and Pippin are still with Treebeard. It’s time for the Entmoot, a meeting of Ents. In the movie, Merry and Pippin get frustrated with how long it takes. And it is true that an Entmoot takes quite some time. But we’ll come back to that in a moment. Back in the movie, the battle is about to begin at Helm’s Deep. Just before it does, though, a battalion of elven archers arrive to assist in the fight. Led by Craig Parker’s character, Haldir, he tells Théoden that there once existed an alliance between men and elves—we are here to honor that alliance. Oh, there was a moment when Legolas wished they had some elven archers, but none arrived. As a little side note, while the movie was inaccurate here in showing the elves at Helm’s Deep, there’s often a misconception that this didn’t happen because this was the age of men. If you recall, in one of those dream sequences with Arwen, her father, Hugo Weaving’s character, Elrond, comes and says the ships are leaving for Valinor. That’s in line with something he said in The Fellowship of the Ring movie where the age of the elves is ending, the age of men about to begin. What he’s referring to there is true, but it’s caused some confusion. You see, he’s not talking about this age. The Third Age, when all of these events are taking place, is not the age of men. What he’s referring to is the Fourth Age, the one that comes after Sauron is defeated, if he is, and the elves are gone. That last part is key, because it’s true that the elves were leaving Middle-earth, by way of the Grey Havens. That’s the name of a port in the elvish lands, where the ships would take the elves would take to Valinor, a land beyond Middle-earth. So the point here is that there were no elves at Helm’s Deep—well, beyond the ones that came with King Théoden. Legolas, for example. Back in the movie, the forces of Isengard are standing outside Helm’s Deep, shouting and screaming as they wave their swords. Then, an old man on the wall accidentally lets an arrow loose. Everyone pauses while we see the arrow fly through the rain and kill an Uruk-hai. Then, the battle begins. That’s not how it began. In truth, it was the orcs who shot first. When they arrived outside the walls, they wasted no time in unleashing a cloud of arrows. Oh, and speaking of arrival…they arrived right on the heels of Théoden’s men. As the battle rages on, back in the movie, we’re taken to Fangorn Forest to the Entmoot. Merry and Pippin eagerly await their decision…and then they find out the Ents have agreed that the two hobbits aren’t orcs. All this time, and they haven’t come to a decision on Saruman. Treebeard tells a frustrated Merry not to be hasty. He explains that Ents don’t say anything unless it is worth taking the time to say. That’s true, but it’s not something Treebeard said here at the Entmoot. In fact, Treebeard explained when he first met the two hobbits that speaking in Old Entish requires time. So Ents don’t bother taking the time to say something if there is not the time to say it. But with that in mind, yes, an Entmoot could take quite some time. Back at Helm’s Deep, in the movie, the battle rages on. We see a sort of a game going on between Legolas and Gimli. They’re each counting the number of orcs they kill—it’s a competition. Although the character of Gimli we saw on screen was much more of a comedic relief than he really was, it’s still true that he and Legolas had a sort of competition going on at the battle of Helm’s Deep. From time to time, Gimli would call out his number. Twenty-one! To which Legolas would reply that he’s already at two dozen. Then, heading back to the movie’s timeline, the forces at Helm’s Deep are seemingly holding off the invaders until they breech the wall with a massive blow. This is done through the sewer drain, something Wormtongue told Saruman about, and the use of gunpowder. That’s sort of true, although the book never really explains the gunpowder. Well, for all we know it’s not gunpowder. The movie doesn’t really call it that, but we can clearly see Saruman with a black powder. In the book, though, none of that is explained. It came as a shock. All of a sudden, there was a flash of flame and smoke. Through what Aragorn called the devilry of Saruman, there emerged a gaping hole. Orcs poured in. Oh, and in the movie all we see are orcs. But in truth there were more than orcs. There were hillmen allied with Saruman’s forces who fought at Helm’s Deep. While we’re spoiling some of the things we see in the movie, remember that scene where we see Orlando Bloom’s version of Legolas sliding down the stairs on a shield, shooting arrows as he goes? Well, that didn’t happen. Back in the movie, we jump away from the battle at Helm’s Deep back to the Entmoot. It’s coming to an end and, according to Treebeard, they’ve decided not to partake. The Ents will not go to war. Then, as Treebeard is giving the two hobbits a ride to the north of Fangorn where they can make their way home, Pippin asks Treebeard to drop them off on the south side of the forest. That will take them past Isengard, which is exactly his plan. When they get there, Treebeard is shocked. The trees…they’re gone! While building his army, Saruman has cut many of the trees from Fangorn Forest down. Angered, this is the final straw for Treebeard who then calls the rest of the Ents to war. The gist of that is true, but that’s not at all how that happened. Remember when Pippin first met Treebeard and he asked the Ent who Saruman was? Well, in reply to that, Treebeard went on to explain what he knew of Saruman, which admittedly wasn’t a lot since he hadn’t kept up with the history of wizards. Except with Fangorn Forest neighboring Isengard, Saruman used to venture into the forest to chat with Treebeard. This is what the Ent recalled to the hobbits, and as the conversation continued it became clear that Treebeard was realizing that Saruman was the one who was letting more and more orcs into the forest. He was once a wizard who loved the woods, but that changed. His mind is made of metal, only caring for nature when it suits him. So the truth of it was that Treebeard was well aware of the destruction Saruman was doing to the forest. Remember, the Ents are, as the hobbits mention in the movie, essentially a shepherd of trees. Knowing the details of their forest is what they do. It’d be silly to assume that Treebeard wouldn’t have a clue about what Saruman was doing on the southern edge of Fangorn Forest. After Merry and Pippin relayed their stories, though, Treebeard was convinced. Saruman must be stopped! So the Entmoot was about Treebeard convincing the other Ents to go to war, not Merry and Pippin convincing Treebeard about anything. Going back to the movie, things turn for the worse after the explosion that breeched the wall. All hope is nearly lost for the soldiers at Helm’s Deep when Aragorn suggests to Théoden that they have one last ride—surprise the orcs and ride out to meet them head-on. So they do. And just then, Gandalf the White reappears with Éomer’s Rohirrim. These additional forces coming from the other side ends up turning the tide of the battle, allowing the men to defeat Saruman’s forces. The basic gist of that is true, although it wasn’t Aragorn who suggested to Théoden that they ride to meet the enemy head-on. It was Théoden who suggested that. And when they did, it caused a lot more confusion than the movie made it seem. Oh, and remember when we learned that Éomer was actually in Helm’s Deep the whole time? Well, that begs the question, if Éomer was there the whole time and, as we learned before, Gandalf did split off from the Rohirrim to run an errand…what errand did he run? Well, he did go off to get help. In the movie that’d be Éomer. But since he was actually at Helm’s Deep, it couldn’t have been him. In truth, he went to get someone that’s not even in the movie. That would be Erkenbrand, the lord of the Westfold of Rohan. But just like we saw in the movie, this was the turning of the tide. With the sudden reinforcements, Saruman’s army is overrun. Back in the movie, the Ents have gone to war. And a glorious destruction they bring to Isengard. With all of the troops off at Helm’s Deep, there’s not many there to defend. The Ents even break down a dam to flood Isengard, killing those orcs left in defense. That’s true, although there were some changes. For example, the Ents actually diverted the nearby River Isen after they killed or scared off all of the orcs. Oh, and one of the big differences is one we already saw in the movie. Remember when Grima Wormtongue is talking to Saruman and strategizing how to attack Helm’s Deep? Well, that didn’t happen. It was only after the Ents attacked Isengard that Wormtongue arrived. While all of this is going on, back in the movie, we see Frodo and Sam at Osgiliath. That’s where they went after being captured by Faramir. Here, Frodo almost succombs to the Ring and gets captured by a Nazgul flying overhead. Sam pulls him back and Faramir shoots an arrow at the Nazgul, saving Frodo. After this, still in the movie, Frodo and Sam are released by Faramir. Well, the battle at Osgiliath happened, it’s just that Frodo, Sam and Gollum weren’t there. If you remember, earlier we learned that Faramir let them go after initially capturing them. He didn’t take them to Gondor with him. Going back to the movie, we see our heroes mounted on horseback. King Théoden, Éomer, Legolas, Gimli and Aragorn alongside Gandalf the White. It’s Gandalf who speaks. Sauron’s wrath will be terrible, his retribution swift. The battle for Helm’s Deep is over. The battle for Middle-earth is about to begin. They look over the landscape at the wilderness beyond. Way off in the distance, thunder, lightning, a great fire and darkness cover the land of Mordor. As Ian McKellen’s narration continues, he explains that our hopes now lie with two hobbits somewhere out there. The scene cuts to Frodo and Sam, being led by Gollum. They’re walking through woods. Then, as Frodo and Sam chat about whether or not their story will be turned into songs, we don’t really notice Gollum disappear. Off to the side, Gollum and Sméagol have another chat with each other. This time, Gollum wins. But he’s not going to kill the two hobbits himself. Instead, both Gollum and Sméagol agree that they could let her do it. Then, hopping back out from behind a tree, Gollum starts leading Frodo and Sam again—follow me! Many of the smaller details like the conversations and such were changed for the film, but the overall gist is true. If you recall, in the book we already had the conversation where Sam overheard Gollum talking about her. Instead, in the book we actually find out who “she” is and go through many of the scenes that were moved to the third movie. This very much in the same way many of the scenes from the beginning of this movie were intertwined with the ending of the last one. Alas, since this is where the movie ends here, though, this is where we’ll end our story today. Just like we did with the movies, we’ll have to wait to find out who “she” is.